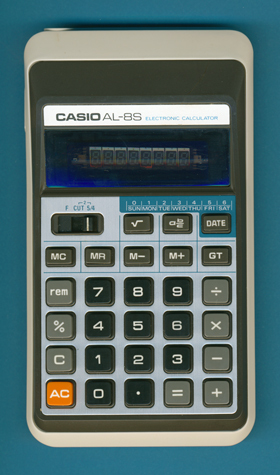 Size: 5.6" x 3.2" x 0.9"
This Casio AL-8S introduced in 1976 followed the AL-8, the first hand-held calculator operating and displaying fractions. The not very intuitive approach with a [P] key for six pre-programmed functions accessible through a larger slider switch called "Function Mode Selector" was replaced with dedicated [a b/c], [SQR], [GT] and [DATE] keys. Unfortunately lost the AL-8S with these changes its unique time / angle statistical calculations. Dismantling this Casio AL-8S calculator manufactured in 1976 reveals a design centered around a Hitachi HD36133 single-chip calculator circuit while its predecessor AL-8 and sibling AL-10 used a NEC uPD573C part. © Joerg Woerner, May 15, 2011. No reprints without written permission.